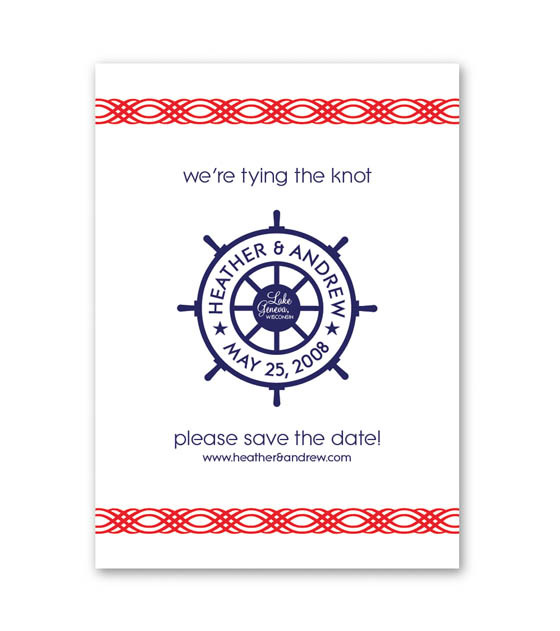 Nautical Save The Date - Now on Etsy! Tying the knot next summer? 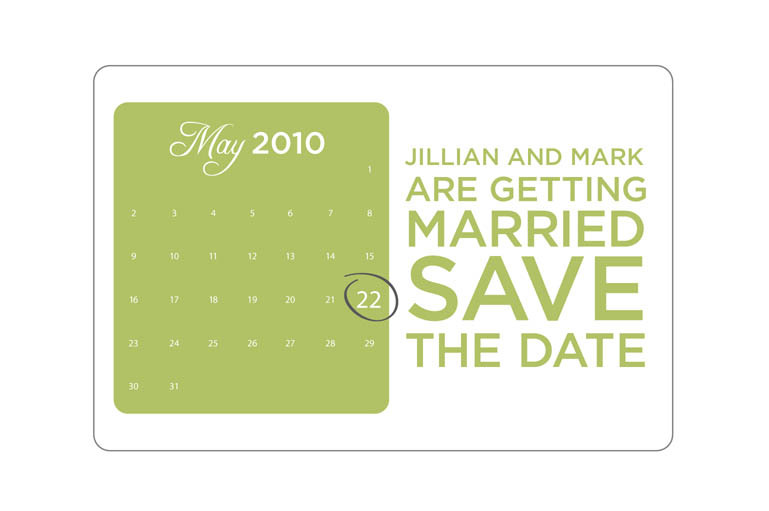 Now is the perfect time to send out your save the dates. This fresh and totally sophisticated nautical design will have your guests excited for your big day. 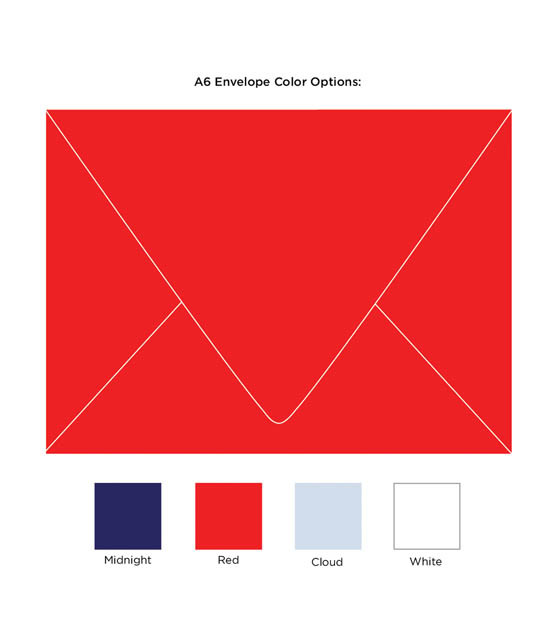 Each card is personalized with your wedding information and comes with a matching A6 envelope in the color of your choice. Check out the Etsy listing for pricing and other details. Happy turkey week! I hope everyone has a wonderful (and filling!) Thanksgiving. 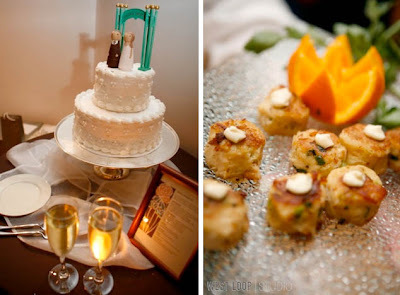 As always, the holidays inspire great wedding ideas and themes. 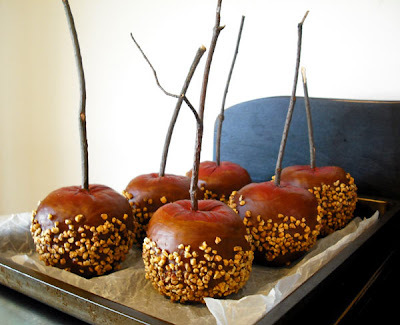 I love candy apples...and I think they would make amazing wedding favors. Believe it or not, the above apples are actually fake - I couldn't believe it either. Image source here. I finally got around to framing some of our favorite wedding photos for our home. 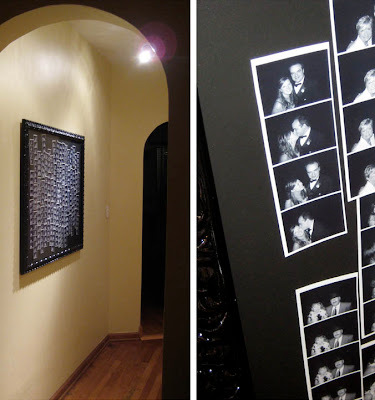 I used Snapfish to print 5x7 and 8x10 prints. 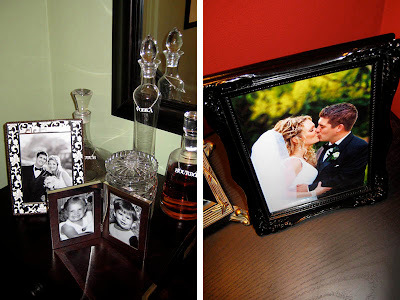 I bought a few new frames and also repurposed some that we had used at our wedding reception. The two-fold frame is of Luke and I when we were 4 years old - we had it displayed (amongst others) during our cocktail hour. 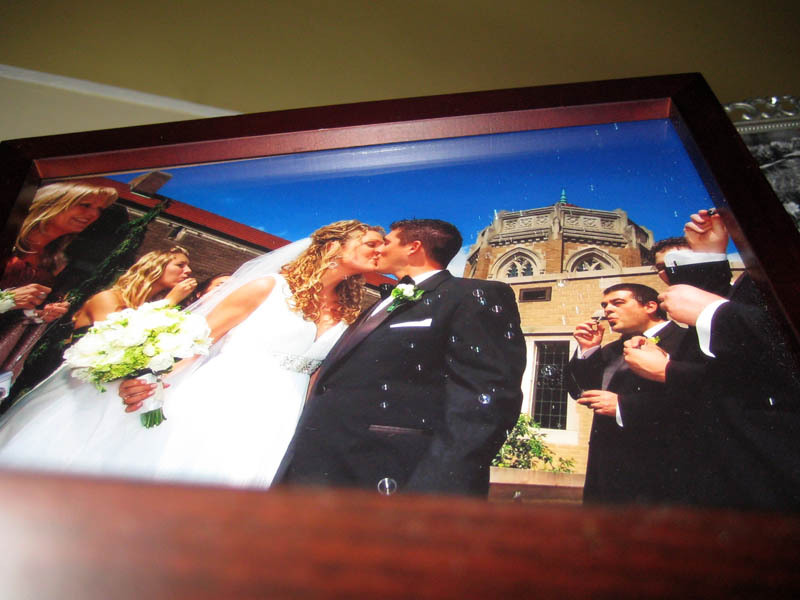 For some reason, a lot of our favorite shots happened to be pictures of us kissing (gotta love it)! The other day one of my good friends came over to our house and so kindly stated "you have a lot of photos of yourselves in this place"...I replied... "we're newlyweds, what do you expect? if and when we have kids they'll take over our home from top to bottom!" 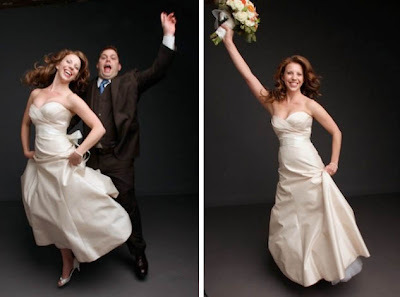 You have to embrace your wedding photos while you can, right? Just finished concepting Save The Date designs for Jillian and Mark. They'll be tying the knot this May in Chicago. These designs were the three runner ups - I'll post the final design once it is complete. The couple wanted to incorporate a photo of themselves as well as utilize a postcard format. I threw in the "calendar" layout for fun (I like it!). Luke and I went back and forth deciding whether or not to hire a professional videographer for our wedding. We knew that we would want the memories, but we weren't sure who to use or if our budget would allow for it. After extensive online research and a few phone calls, I found A Family Affair Video in Lyons, IL. Scott and Barb Scheman, the owners, were very professional and accommodating over the phone. They were willing to work within our limited budget, and they helped us come up with a video package that fit our needs. Luke and I decided that we wanted only our ceremony (not reception) captured on camera. Our package included anything taking place at the church...so the arrivals of the bride/bridesmaids and groom/groomsmen, the processional, ceremony, recessional and trolley "getaway." 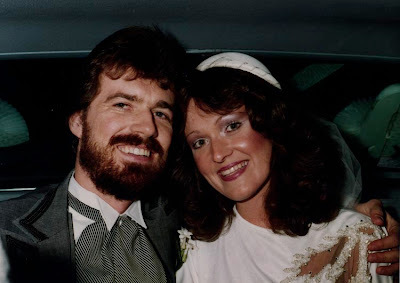 If you've been keeping up with my blog, you know that the morning of our wedding day was not pretty. The stress and anxiety caused by storms and a major power outage the night before, left most things a mess. Fortunately, the church never lost power, so we knew the ceremony was still on. Nearly forgetting about the videographer in the midst of the chaos, I was pleasantly surprised when I saw Scott taping my bridesmaids and I as we arrived at the church. Scott was wonderful to work with the entire afternoon - we hardly even knew he was there! He captured everything we wanted and even took additional time after the ceremony to shoot close-ups of our flowers and other important details. 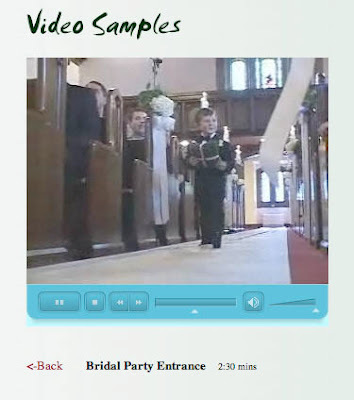 If you click here, you'll be directed to a sample video of our "Bridal Party Entrance" (processional). That's Caleb, our ring bearer, above - he's the cutest 4 year old in the world! You'll also notice that our church had the narrowest aisle in the world (haha). The sample clip is only a small sliver of the 50 minute, fully edited video that we recently received from Scott and Barb. And yes, our package included professional editing with voice and music overlays. Luke and I were able to choose 3 songs to use for the opening and closing credits of the video. It was an absolute delight to work with A Family Affair Video. We were 100% satisfied with our experience. 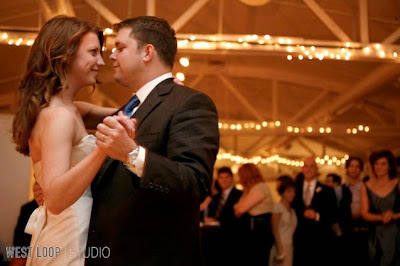 I would highly recommend Scott and Barb to anyone looking for high quality videography services for a wedding. Currently, AFAV is offering "Video Stimulus Packages" for couples looking to incorporate videography into their wedding on a budget. You can also view additional testimonials and video samples on their website. Thanks again, Scott and Barb! I was so excited to stumble across these amazing bridal gems. 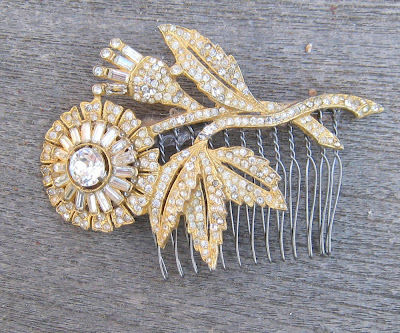 Noaki, a California based designer, "resurrects heirloom pins, broken earrings and forgotten dress clips" to bring you the wonderful creations you see below. She has a website, blog and etsy store that are definitely worth checking out. 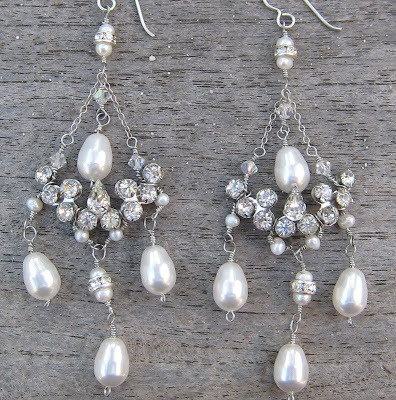 I love the fact that these pieces are not only beautiful, but functional too...who's to say that after your wedding day you can't wear them with your favorite pair of jeans and tank top! 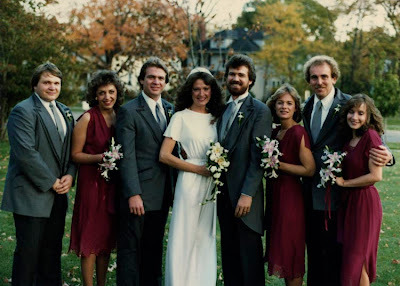 Here's a blast from the past...my parent's wedding photos! Personally, I think they were pretty hip for the early 80's. 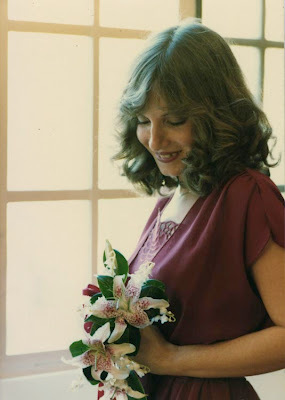 My mom's dress was beautiful - if it fit me I would have seriously considered wearing it for my own wedding! 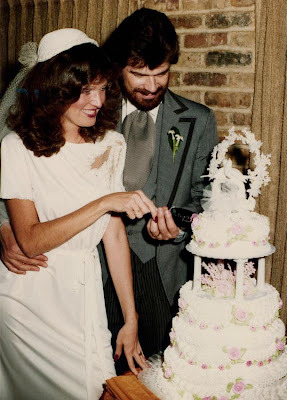 My mom and dad just celebrated their 29th wedding anniversary last month, so a big congratulations is in order. Next year is the B-I-G 30! Thanks to both of them for being such good role models and parents. Silk vs. Real flowers...certain elements of this trend are coming back. Grecian inspired bridesmaid dresses = definitely back in style! Long coat tails on the groom...this will make it's way back, just wait & see. The "bonnet veil" is super cool...for today's styles go here. Frilly cake, with kitschy topper - I love it! Buy your own for only $6! Yellow gold wedding bands...we jumped on that one! The "Farrah Fawcett" - we've seen this style come & go in the 2000's. Full beard and mustache...not so sure about this one! Love you, Dad. I'm so giddy about the new art piece hanging up in our condo - it makes me smile every time I walk by! 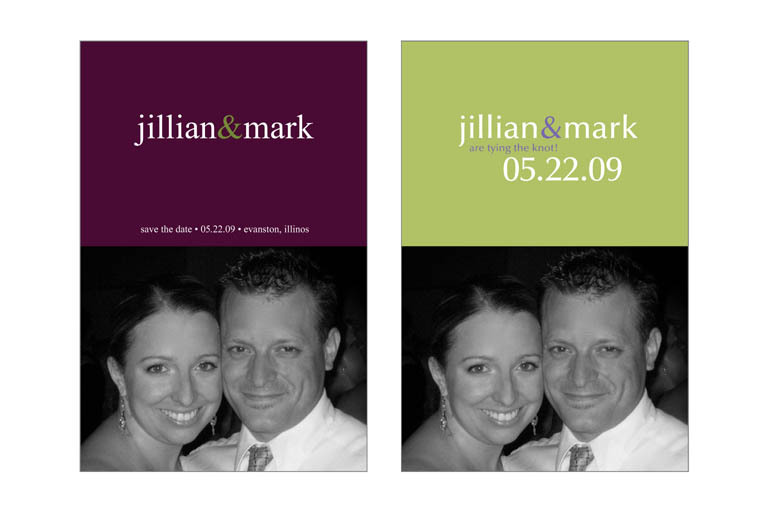 When Luke and I decided to have a photo booth at our wedding reception, I knew I had to do something cool with the photos...albums are nice, but they get looked at once or twice and are put away never to come out again. I wanted something creative and different. 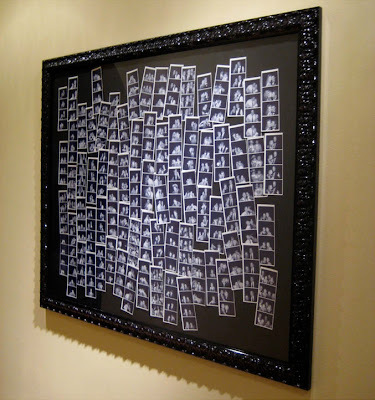 I came up with the idea of having our photo booth strips placed into one, large frame in a montage-like style. I wanted it to feel organic and playful. I started to investigate doing the whole project myself, but decided it was best left to the experts. I'm glad I did, as it ended up being a 50x30 inch size piece (aka: huge)! 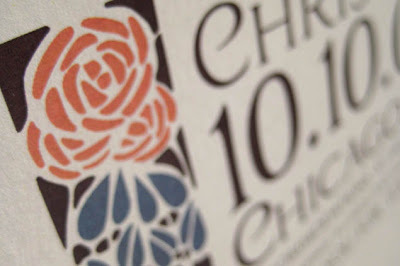 Christina and Dayne married in Chicago on October 17th. 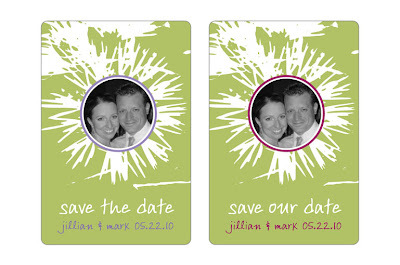 I worked with the couple on their Save The Date and Invitation designs. Christina was kind enough to share her professional photos with me, so I'm sharing some of my favorites with you today. 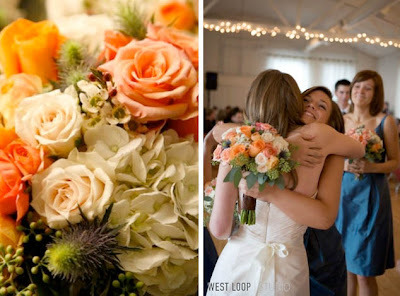 The couple's ceremony and reception took place in the same venue, West Loop Studio. All photos were captured by the Studio as well. Congratulations C & D! Here are a few notes from the bride: My favorite part of the whole day was the ceremony, which was incredibly personal. Not wanting to do a religious ceremony, one of our biggest concerns was on how to make the ceremony meaningful to ourselves and to our guests. We did a couple of things to achieve this: First, we had select family members prepare a short write-up on what love and marriage meant to them and then present a symbol that represented their thoughts during the ceremony. Second, we took inspiration from our trip to Scotland (where we got engaged) with the tradition of a Quaich. 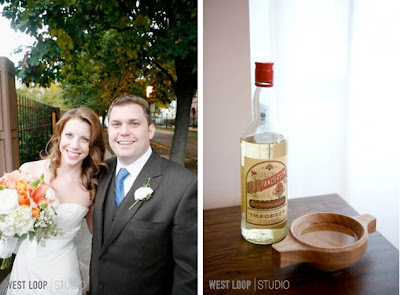 We filled our Quaich with Aquavit (since Dayne is of Scandinavian heritage) and Dayne and I shared a sip from the Quaich and then had each member of our wedding party share a sip. We did a cocktail reception with passed hors d'oeuvres and an hors d'oeuvre buffet. I loved not having a sit-down dinner as this really heightened the more laid-back, party atmosphere. 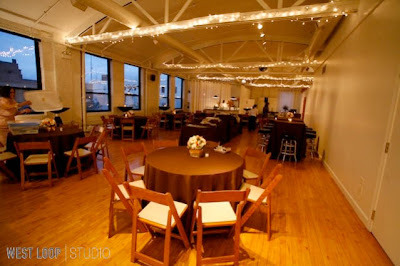 As we got married at an event space that doubles as a photography studio, we used the venue's photography services, which included use of their portrait studio. The portraits of family and friends throughout the night are so much fun! I just came across this amazing GIVE AWAY over at Always a Bridesmaid, Never a Bridezilla. The "professional bridesmaid" has teamed up with Barbara Kua Calligraphy to offer this great give away. One lucky reader (ooh, I hope it's me! 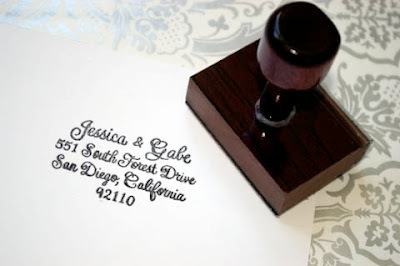 ), will receive a customized calligraphy stamp for all of their addressing needs. This is the perfect solution for many of my clients, as they don't want to print labels for their wedding invitations, but they also don't have the kind of budget for a calligrapher. I would love to get one of these for myself...Luke and I are still trying to finish up our wedding thank you's and this would come in VERY handy! 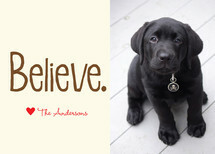 Shop my holiday photo cards at Minted.com.